Atocha Design was started from our twin passions for music and design. We can't remember when we weren't ever obsessed with music and records. Picking a favorite album to play for friends and family, listening to a new discovery we stumbled upon at the local shop, discussing cover art that excited or confused us for decades … These simple but cherished rituals that we share with so many others inspired us to create Atocha Design furniture for fellow music lovers. And, like you, building our music collection has been a lifelong project—intimate, significant, and unique. So these collections which we put so much time and care into deserve to be preserved, accessible, and appreciated via a special furniture piece that is both beautiful and functional. We wanted to offer music enthusiasts something that would provide easy access to your entire music collection while allowing you to enjoy the album cover artwork, and not just the spines, as you browse through it. 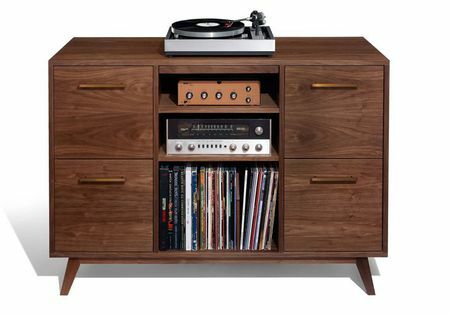 At Atocha Design, our specialty is handcrafted, mid-century–inspired furniture for storing records, CDs, and audio components. 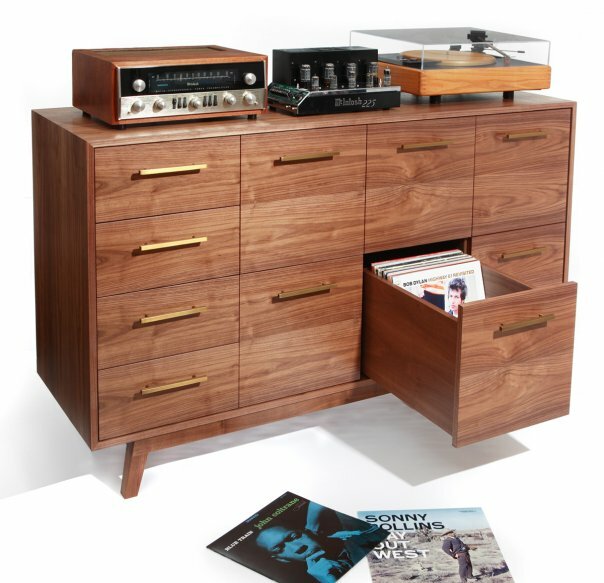 Our designs allow quick access to your music collection and easy storage when it's not in use. 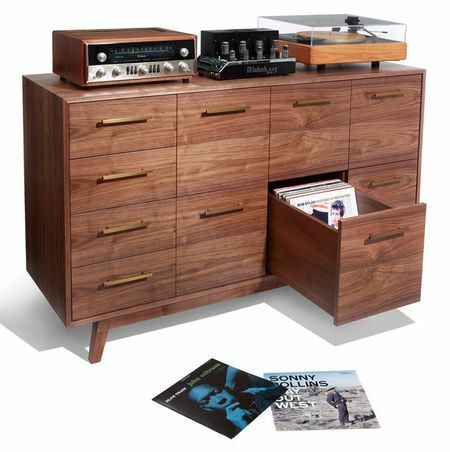 Careful consideration has gone into the design, engineering, and construction of our pieces to specifically accommodate the heavy weight of an LP collection. Trust your preferences. Atocha Design is a custom studio and can produce your furniture piece from a range of wood and hardware options. 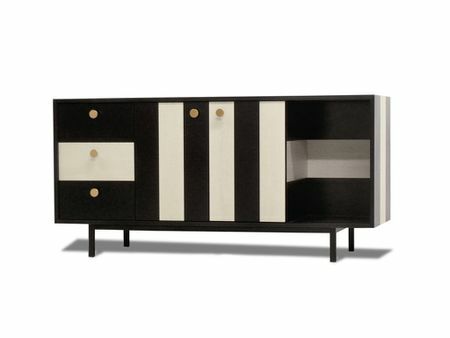 Each cabinet is made to order; if you don't find what you're looking for, we can work with you to create something unique to match your needs. 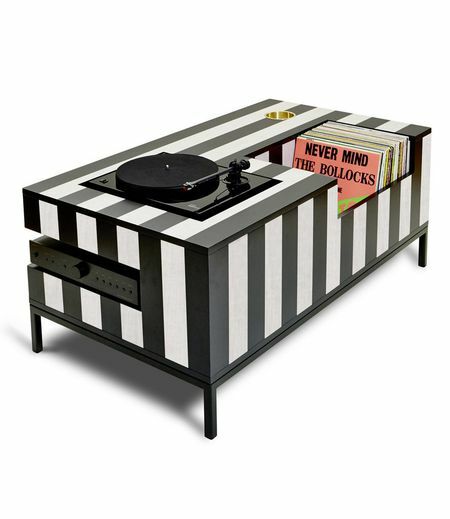 Our furniture is handcrafted entirely in the U.S.A., for and by design-minded music lovers. As a companion to the Record Stand, the ATOCHA DESIGN DJ Stand gets you into music-mixing with minimalist design and maximal style. DJ furniture takes a step forward with our exciting new version of the DJ desk, the ATOCHA DESIGN DJ Stand. 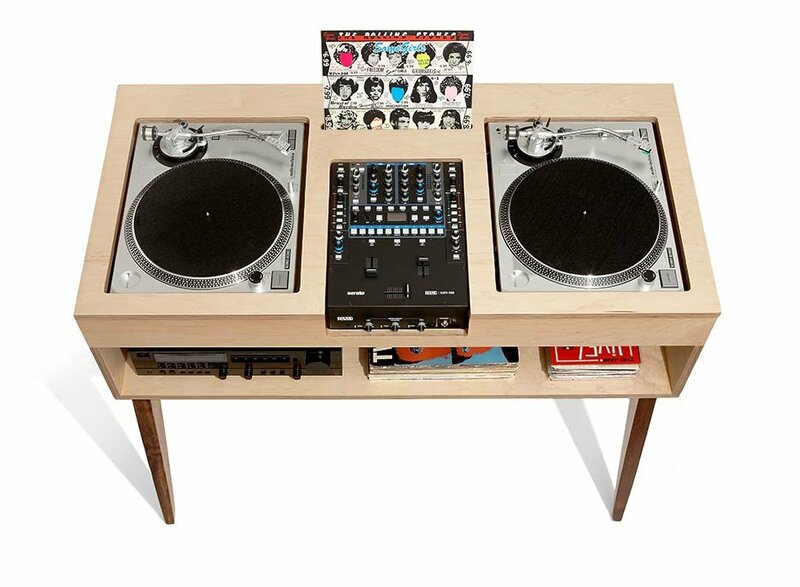 The DJ Stand is available in "battle-style" or classic "non battle-style" positions for two turntables and a mixer. The shelf below allows you to conveniently store components, accessories, LPs or singles, with a pivoting bayonet for hanging your headphones. If you rock both digital and analog, the rear panels are dual-purpose, for venting as well as for laptop-stand clamps, and offer internal cord access for visual clarity. The top lifts for easy gear set-up and convenient adjustments at any time. We use a multi-plug inside the case to plug all electronics into, allowing just one cord to drop down. The DJ Stand ships via FedEx Freight 8 weeks from time of order. Made in New York. International shipping available, please email us directly for international rates, they will not automatically show on our check-out page. Some assembly required: Legs attach to body with an allen hex wrench, provided. The DJ Stand ships via FedEx Freight in 8 weeks from time of order. The DJ Stand is is handcrafted in the U.S.A. with solid American black walnut legs. The body is formaldehyde-free, solid birch–hardwood core plywood with a maple-hardwood top layer. ATOCHA DESIGN furniture is GREENGUARD Indoor Air Quality Compliant. Our pieces are made from sustainably harvested wood, and are formaldehyde- and lead-free.